5.1.5 Construct algorithms using two dimensional arrays. 5.1.11 Describe the features and characteristics of a dynamic data structure..
5.1.15 Define the terms: parent, left-child, right-child, sub tree, root and leaf. A procedure or function that can call itself until a base case is reached. Work thru Khan Academy as far as properties of a recursive algorithm click here go as far as properties of recursive algorithms. What is the base case in a recursive algorithm ? Loop or Recursion: Which do you think is the most efficient and why. // time memory usage can one be traded off the other / is using less memory, but slower better than using lots of memory and fast ? What are the dangers with recursion. What are if any the advantage of recursion, will this be true for all programming languages ? Extension : What is tail recursion optimization ? We can use a loop to work out a factorial of any number see php example below. Create an equivalent recursive function to work out the factorial of any number. Write a recursive function that computes the sum of all numbers from 1 to n, where n is given as parameter. This is an embedded &amp;amp;amp;amp;amp;amp;amp;amp;amp;amp;amp;amp;amp;amp;amp;amp;amp;amp;amp;amp;amp;amp;amp;amp;amp;amp;amp;amp;amp;amp;amp;lt;a target='_blank' href='https://office.com'&amp;amp;amp;amp;amp;amp;amp;amp;amp;amp;amp;amp;amp;amp;amp;amp;amp;amp;amp;amp;amp;amp;amp;amp;amp;amp;amp;amp;amp;amp;amp;gt;Microsoft Office&amp;amp;amp;amp;amp;amp;amp;amp;amp;amp;amp;amp;amp;amp;amp;amp;amp;amp;amp;amp;amp;amp;amp;amp;amp;amp;amp;amp;amp;amp;amp;lt;/a&amp;amp;amp;amp;amp;amp;amp;amp;amp;amp;amp;amp;amp;amp;amp;amp;amp;amp;amp;amp;amp;amp;amp;amp;amp;amp;amp;amp;amp;amp;amp;gt; presentation, powered by &amp;amp;amp;amp;amp;amp;amp;amp;amp;amp;amp;amp;amp;amp;amp;amp;amp;amp;amp;amp;amp;amp;amp;amp;amp;amp;amp;amp;amp;amp;amp;lt;a target='_blank' href='https://office.com/webapps'&amp;amp;amp;amp;amp;amp;amp;amp;amp;amp;amp;amp;amp;amp;amp;amp;amp;amp;amp;amp;amp;amp;amp;amp;amp;amp;amp;amp;amp;amp;amp;gt;Office Online&amp;amp;amp;amp;amp;amp;amp;amp;amp;amp;amp;amp;amp;amp;amp;amp;amp;amp;amp;amp;amp;amp;amp;amp;amp;amp;amp;amp;amp;amp;amp;lt;/a&amp;amp;amp;amp;amp;amp;amp;amp;amp;amp;amp;amp;amp;amp;amp;amp;amp;amp;amp;amp;amp;amp;amp;amp;amp;amp;amp;amp;amp;amp;amp;gt;. A two-dimensional array is simply an array in which each element contains another array. The following illustration shows this. ables have many applications and so do two-dimensional arrays. 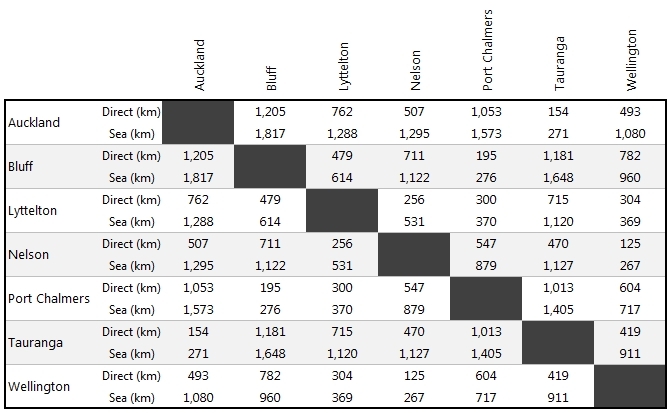 For instance, tables can be used to store the distances between cities. This could be used for calculating the total distance of a given path or to find the shortest route for a given tour. Two-dimensional arrays are also often used for games, e.g. battleship or chess. Programming such a game is a good exercise to practise algorithmic thinking and the use of arrays! Further reading: WikiBooks provides an excellent explanation of arrays and has good practice exercises for algorithms using two-dimensional arrays here. A stack is an abstract data type in which accesses are made at only one end. You can insert an item as the first one and you can remove the first one. This ADT models many things in real life. Accountants call it LIFO, which stands for Last In First Out. The plate holder in a cafeteria has this property. We can only take the top plate. When we do, the one below rises to the top so the next person can take one. Canned goods on a grocer’s shelf exhibit this property. When we take the first can in a row, we are taking the last can put in that row. Another way of stating the accessing behavior of a stack is that the item removed is the item that has been in the stack the shortest time. Viewing a stack from this perspective is more abstract. The insert has no constraints, the entire LIFO behavior is specified in the removal operation. The mental image of the cafeteria plates has left an imprint on the traditional names used for the insert and delete operations. The insert is called Push and the delete is called Pop. We Push and item onto the stack and Pop an item off the stack. A stack does not have the property of length, so there is no operation that returns the number of items on the stack. We do need operations that determine whether a stack is Empty because trying to Pop an item when the stack is empty is an error. Now we Pop off one item at a time and print it. The first item printed is 60, the next item printed is 75, and so on. The original list has now been printed in reverse order using the stack. Any sequence of items put on the stack comes off in reverse order. When we call a function memory is allocated from the stack. initialized data and unitialized data segments contain global variables. The stack is used to store local variables and function parameters. If you call a recursive function without a base case what will happen? Stack is used for static memory allocation and Heap for dynamic memory allocation, both stored in the computer's RAM . Where are the stack and heap stored? They are both stored in the computer’s RAM (Random Access Memory). How is memory deallocated on the stack and heap? How long does memory on the stack last versus memory on the heap? Once a function call runs to completion, any data on the stack created specifically for that function call will automatically be deleted. Any data on the heap will remain there until it’s manually deleted by the programmer (example: by using free() function built in c). Which is faster – the stack or the heap? And why? The stack is much faster than the heap. This is because of the way that memory is allocated on the stack. Allocating memory in this is as simple as moving the stack pointer up. Can the Stack and Heap grow in size? The stack is set to a fixed size, and can not grow past it’s fixed size (although some languages have extensions that do allow this). So, if there is not enough room on the stack to handle the memory being assigned to it, a stack overflow occurs. This often happens when a lot of nested functions are being called, or if there is an infinite recursive call. Access methods: • enqueue • dequeue • isEmpty. A dynamic data structure is a data structure that is flexible in growing or shrinking in size. This can make memory allocation more efficient, by only using as much as is necessary, while also allowing the programmer to design more flexible algorithms, where the size of a data structure is not known before runtime. Nodes and pointers are two concepts commonly used for dynamic data structures. The idea is that each data element is allocated a node for storing information. In addition, each node has a pointer which points to the memory space in which the next node (data element) is stored. Like arrays, Linked List is a linear data structure. Unlike arrays, linked list elements are not stored at contiguous location; the elements are linked using pointers. Circular linked list is a linked list where all nodes are connected to form a circle. There is no NULL at the end. A circular linked list can be a singly circular linked list or doubly circular linked list. Binary trees have the characteristic of being ordered. The left-child(e.g. 3) must come before the parent node (i.e. 8) and the right-childmust come after the parent node (i.e. 10). For this reason each node in a binary tree can have a maximum of two child nodes only. Non-binary trees on the other hand do not follow these rules and could be used for example to represent animal species trees. A non-binary, or multifurcating, tree is a tree in which at least one node has more than two children. Binary Tree is a special data structure used for data storage purposes. A binary tree has a special condition that each node can have a maximum of two children. A binary tree has the benefits of both an ordered array and a linked list as search is as quick as in a sorted array and insertion or deletion operation are as fast as in linked list. ​Root − The node at the top of the tree is called root. There is only one root per tree and one path from the root node to any node. ​Parent − Any node except the root node has one edge upward to a node called parent. ​Child − The node below a given node connected by its edge downward is called its child node. ​Leaf − The node which does not have any child node is called the leaf node. 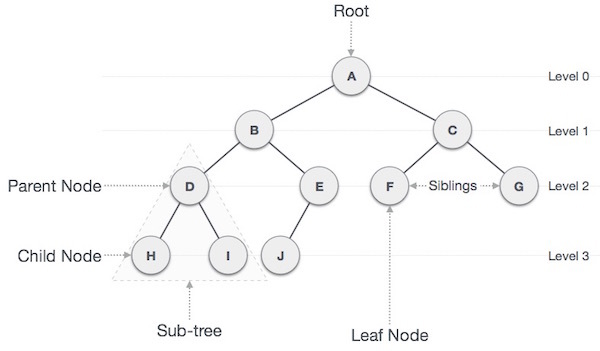 ​Subtree − Subtree represents the descendants of a node. ​Visiting − Visiting refers to checking the value of a node when control is on the node. Recursive Definition of Binary Search Tree for every node on the trees the left child smaller than the right child ? Is the right child bigger than the left child ? This is a recursive definition. 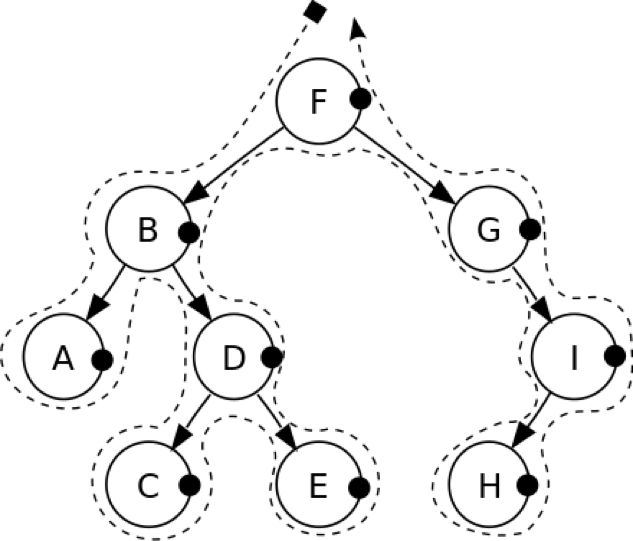 In a tree data structure, each child from a node forms a subtree recursively. Every child node will form a subtree on its parent node. A walk in which each parent node is traversed before its children. Result: F, B, A, D, C, E, G, I, H.
A walk in which a node’s left subtree, then the node itself, and finally its right subtree are traversed. Result: A, B, C, D, E, F, G, H, I. A walk in which the children are traversed before their respective parents are traversed. Result: A, C, E, D, B, H, I, G, F.
The insertion procedure is quite similar to searching. We start at the root and recursively go down the tree searching for a location in a BST to insert a new node. If the element to be inserted is already in the tree, we are done (we do not insert duplicates). The new node will always replace a NULL reference. Searching in a BST always starts at the root. We compare a data stored at the root with the key we are searching for (let us call it as toSearch). If the node does not contain the key we proceed either to the left or right child depending upon comparison. If the result of comparison is negative we go to the left child, otherwise - to the right child. The recursive structure of a BST yields a recursive algorithm. Searching in a BST has O(h) worst-case runtime complexity, where h is the height of the tree. Since s binary search tree with n nodes has a minimum of O(log n) levels, it takes at least O(log n) comparisons to find a particular node. Unfortunately, a binary serch tree can degenerate to a linked list, reducing the search time to O(n). Deletion of an internal node with two children is less straightforward. If we delete such a node, we split a tree into two sub trees. Deletion strategy is the following: replace the node being deleted with the largest node in the left sub tree and then delete that largest node. By symmetry, the node being deleted can be swapped with the smallest node is the right sub tree. A structure to store data or data collections in memory. The structure can grow or shrink dependent on storage requirements. Implemented using pointers to store memory locations in the heap part of memory. A) Assume the stack is empty, what is the sequence of popped values? What is the final state of the stack?